The Efcon® ILS Inline Guillotine is an automatic fixed volume sampler for use on 100 % filled and pressurised effluent lines. The sampled process must be liquid, and free of air / hard solids. 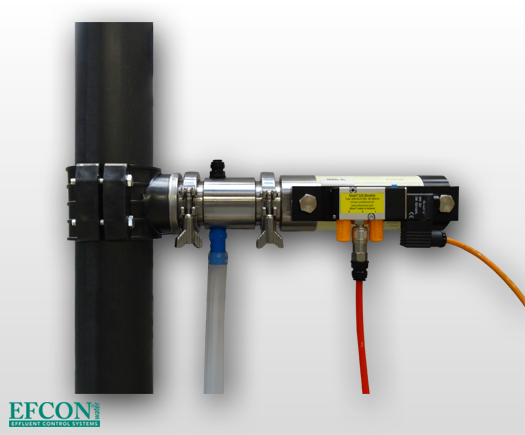 Designed for sampling of raw wastewater, the Efcon® Inline Guillotine sampler works with a maximum process pressure of 2.5 Bar and optional up to 5 Bar. This sampling method complies to ISO 5667-2, 5667-10 and NEN 6600-1 and is equipped with a pneumatic actuator (6-8 bar). The Inline Guillotine Sampler can be volume-, time-, or event proportional controlled via an Efcon® controller or (when ordered only the sampler hardware) via a third party PLC. Mounting fittings for the inline guillotine sampler can be supplied (option) for plastic or Stainless Steel piping. Use in hazardous environment is forbidden unless mentioned in the manual and on the product. Dowload the Efcon® Inline Guillotine Sampler Datasheet (PDF) to discuss it with your colleagues via e-mail or a printed version. Efcon® Water offers full support with annual service and on site support in The Netherlands & Belgium. Throughout Europe we support several specialised distributers. Spare parts are in stock at our distributers but can also be shipped global with UPS, DHL, Fedex etc. At this moment Efcon® Water has multiple specialised resellers in Europe. For interest to become a member of the Efcon® family please contact us. Call +31 347 342 777 or E-mail to info@avm-efcon.nl. © 2019 Efcon® Water B.V.